If you love to fly out of India then you'll definitely have heard about the travel search engine Ixigo, but did you know you can make great savings at the popular website and app with a wide range of discount deals? Here at DealSunny we have the largest and most up to date list of Ixigo coupons on the net, so there's no need to waste your time searching online for a valid deal or coupon again. Simply browse through the list below and if you see an offer you like, clicking the link will open a new window with all the terms and details on how to redeem it. 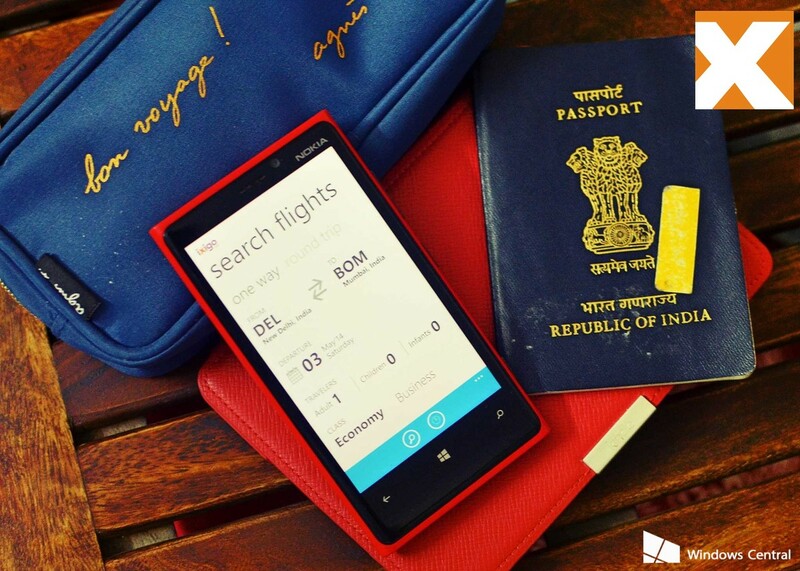 Now you can plan your trip or vacation without paying full price ever again! If travel booking are not what you need today, be sure to check out our full list of merchants, including online stores, service providers, and even food delivery apps. You can save money wherever you spend your cash, if you come to DealSunny first! Ixigo and Mobikwik together offering flat Rs. 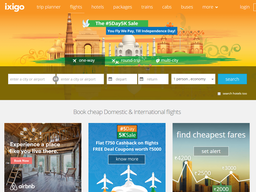 400 cashback on flight tickets booking. Offer applicable on a minimum booking of Rs. 6000. It will take Ixigo upto 45 days from the date of claim to transfer your cashback in your Citrus wallet. Ixigo is a leading travel booking search engine, based out of Gurgaon, India, which allows users to search for flights, hotels, transport and accommodation based on their preferences. Rather than offering a direct booking service, they aggregate and price compare from other leading booking services, which means they can provide users with a much broader range of options. Ixigo can be accessed via web browser at Ixigo.com or by using their mobile apps if you are on the go. One feature that helps them stand out is their exclusive deals with airlines and other travel providers, which allow customers to save money over using individual booking sites. These are commonly redeemed by using special Ixigo coupons, a list of which we keep up to date here at DealSunny. So before finalizing a booking, remember to check back to this page to see what's available and you're sure to get a great discount! Ixigo was founded in 2007 by Aloke Bajpai and Rajnish Kumar, both who still lead the privately held company today. They believed that although travel was becoming easier in India thanks to online travel agents, there needed to be a service that allowed users to shop around and find the best prices rather than the marketed "best prices" of any one company. The idea of a travel infomediary was so well received that the company was chosen as one of the top six startups on the internet in India, before it had even opened to the public. After several rounds of funding the company received its largest investment in 2011, when SAIF Partners and MakeMyTrip pledged $18.5 million. Today the service allows travellers to compared over 150 different booking sites for the cheapest flights, transport and accommodation. "Ixigo works towards giving travellers a one-stop-shop to get all their travel related answers," reads their about page. Ixigo is India's largest online and mobile travel search engine, allowing you to find the best prices for a comprehensive range of travel essentials, including flights, accommodation and transport. They are partnered with over 150 different travel websites, which means you can compare prices across the board to get the truly best deal out there. They also help users plan where to eat, what to visit and see, and various other tips and trivia for your desired trip. Over 10 million travelers have used Ixigo and their apps! While Ixigo does not offer tickets and bookings themselves (they transfer you over to the travel site or provider in question) they do still offer their own unique deals if you search for these bookings through them. The Ixigo promo code you choose will depend on your desired destination, as some coupons might be applicable on all searches, while others might offer deeper savings for specific destinations or travel providers. Click one you want to use to reveal the full terms and how to redeem it on the Hotels.com website or app. Ixigo will search and compare domestic and international Flights, Hotels, Resorts, Trains, Cabs, Buses, and combination Packages of them all. They also offer a cashback scheme for all flights booked through them. As well as the main travel search function Ixigo also fosters a community for travelers. This includes the Ixiblog, which is full of company news, travel tips, destination info, and other interesting topics. There is also the "Travel Stories" section viral news and content related to traveling and having fun while doing so. Current popular destination on Ixigo include Kuala Lumpar, Paris, Amsterdam, Singapore, Bali, New Delhi, Stockholm, and Bangkok. There are also popular holiday packages, including Paradise in Malaysia, Kashmir Sonmarg Premium Package, and many others. Ixigo Cashback: Ixigo now offer cashback on both flight and cab bookings that were generated through their site and app. All you have to do is make the bookings as usual and then within 45 days browse to Ixigo cashback offer page and fill in your booking details to claim. Cashback is made in to your Citrus Wallet. Ixigo Coupons: These are special codes that you can enter on the site before making your booking, which redeem various offers and deals. Only one can be used per booking, so make sure to choose the one that will make you the most savings when browsing our list at DealSunny. A popular choice are Ixigo train coupons. Discount Prices: Although Ixigo functions as a search engine and price comparison site, they occasionally offer their own exclusive discounts if you book through their search and use specific travel partners. You do not have to do anything special to benefit from these savings. App Exclusives: Use their apps for iOS, Android and Windows Phone, and you will gain access to exclusive offers not found on the core website. As well as bookmarking this page to stay up to date with offers, you can also find some exclusives by signing up to their email newsletter, which is sent out with company news and other promotional material. You might also find some exclusives by following them on social media. They have active accounts on Facebook, Twitter and Youtube; the latter which features their commercials, guides, and funny travel related videos. Ixigo itself does not process any payments for the flights, accommodation or transport you find through the search function. Rather it operates as a middle-man that allows you to price compare and find the best deals. That being said most travel providers you find through Ixigo will accept credit cards such as American Express, Mastercard, Visa, Diners Club and debit cards such as Visa Debit, Maestro, and bank issued cards such as HDFC, HSBC, Axis, and Citibank. You may also be able to use Net Banking with most major Indian banks, and mobile payment gateways like Paytm and Citrus Wallet. Just before you are transferred over to the travel provider for your selection, you will notice a promo code box. This is where you can enter an Ixigo promo code from DealSunny or elsewhere, to redeem its associated offer. If valid and entered correctly there will be a confirmation message and your booking will update according to the terms of the offer. For example a Ixigo vouchers will make the cost of your booking on the provider's site drop. Note that only one coupon can be used per order, so make sure you choose the one that will make you the best savings! Finding a flight, hotel, transport or full package is very easy using the advanced Ixigo price comparison search function. First you will need to decide whether you want to use the mobile apps or go to the core website at Ixigo.com using a web browser. The app is available for iOS devices from the Apple App Store, Android Devices from the Google Play Store, and Windows Phones from the Microsoft Store. On Google Play the flights and hotels app has a high user rating of 4.2 stars out of 5, from over 16,000 reviewers. There are also well rated apps for Trains, Cabs and Buses. Before using Ixigo you are advised to register an account. This will only take a few moments and will save your details for easier bookings in the future. You will also be able to see your history from the account page. Whether on the app or website you will first be greeted with an easy search platform for flights, but you can use tabs to find similar options for hotels, packages, trains, cabs, and buses. For hotels for example you can enter the destination, city, region or hotel name, and then select a check in and check out date. You can also select whether the number of room and people that will be joining you and how many rooms you desire. For flights you choose the city or airport you wish to depart and arrive at, the dates of the journey and whether it will be one way, roundtrip or multi-city; and the number of people flying. You can also choose the class of service, such as economy or business. It is much the same process for packages and the various transport options. For flights, once you hit search all of the relevant results for the info you provided will be displayed, beginning with the cheapest first. The listing overviews include times of flights, any available deals, how many stops and which travel provider you will be re-directed to. You can easily sort listings by the highest rated, quickest flight path, or earliest flight time. You can also refine the listing by airline, number of stops, time of flights, and price range, until you can find exactly what you're looking for. Hitting Book next to one of the options will redirect you to the travel providers site, where you can view more details and complete the booking with an accepted payment method. They themselves may also have a box to enter coupon code to make even more savings. The process is very similar for accommodation and transport options. For the majority of travel providers partnered with Ixigo, you will be provided confirmation by email and/or SMS, and most bookings will be digital rather than having any tickets or receipts mail to you by post. Each individual provider, airline, hotel etc will also have their own cancellation policy, so be sure to read it before committing to the booking. Does Ixigo Process Any Bookings Themselves? No, Ixigo functions solely as a search engine and price comparison tool that pools together over 150 different travel providers. Any booking you make will be with one of these providers. However thanks to their partnerships, they do sometimes offer exclusive Ixigo offers that can get you a discount or cashback on your booking. Any questions, cancellations or complaints should be made to the individual travel provider, airline, hotel etc. Ixigo is not liable for anything outside of its own site. Does Ixigo Charge A Fee? No, using Ixigo is entirely free of charge. In fact you will save money by finding bookings through them and using the Ixigo coupons here at DealSunny. The original term Ixigo was the shortened version of "i eXplore i Go". Ixigo use industry standard encryption to protect the data you share with them, and never pass on this information to third parties outside of your chosen travel provider. @vadlamaniroyale We believe this has been taken care of. Please reach out to us in case of anything else. We'd gladly assist you.